PV Solar Panels are becoming ever more common place in the Irish environment. PV Solar Panels is short for Photovoltaic Solar Panels. These panels are a great means of generating free electricity. PV Solar Panels generate DC electricity on your roof and use inverter technology to change to AC electricity for use all around your home. In a domestic situation, PV Solar Panels are more commonly used in a new build scenario, as they are an easy and affordable way of complying with “Part L” of the building regulations. They can of course be used in a retrofit situation also, and a quick phone conversation can ascertain whether this would be suitable in any given situation. 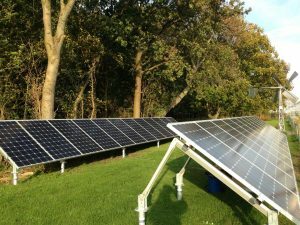 If you don’t utilise all electricity generated from your PV Solar Panels, it will currently go back to the grid and you won’t benefit at all from this. So to help match the suns supply with your homes demand PV Solar Panels can be used in conjunction with electric battery or water heating storage to store any excess energy generated for use in non day light hours. There are various devices in the market now like the Immersun that will divert any excess electricity into the immersion. This will offer you a very limited amount of hot water but take away some of the conventional cost of heating your hot water. if you don’t utilise all electricity generated from your PV Solar Panels, it will go back to the grid and you won’t benefit at all from this. For those who wish to invest in our thermodynamic solar solution also, most models have a “dry line signal” built into its control system. This can be a good way to utilise any excess energy generated from your PV Solar Panels. We have just partnered with a company providing cutting edge “solar edge” technology which allows you to monitor the free electricity generated from your panels from your mobile phone.